In collaboration with NTT R&D, NTT Security demonstrated the latest innovation breakthroughs at NTT R&D Forum held last week in Tokyo. NTT R&D Form is a flagship R&D event of the entire NTT Group, which attracts more than 16,000 visitors, including customers, partners, academia and governments around the world. The event covers all aspects of technology from Artificial Intelligence (AI), Internet of Things (IoT), 5G (and beyond), the cloud, quantum computing, virtual/augmented reality and security. Our breakthroughs are in the areas of botnet detection, edge computing and vehicle security. 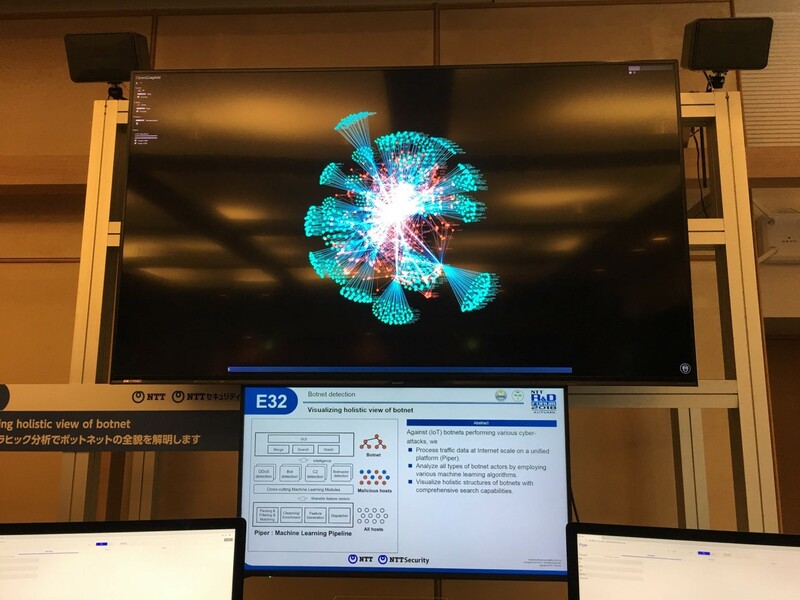 As previously reported, NTT Secure Platform Laboratories, NTT Communications and NTT Security have jointly developed the services for detecting botnet infrastructures in real time by applying machine learning to our own network data. We are enhancing the services further by adding an interactive visualization tool for threat hunting. By entering an IP address of interest, the tool generates and displays a graph that shows related IP addresses and relationship among them. Piper, our analysis platform, can analyze and visualize netflows of billion data points in real time. Its modular design can accommodate different machine learning algorithms without needs of changes to its base architecture. Our Piper software can also be configured and installed in different form factors: from full scale centralized cloud to distributed edge computing environments. 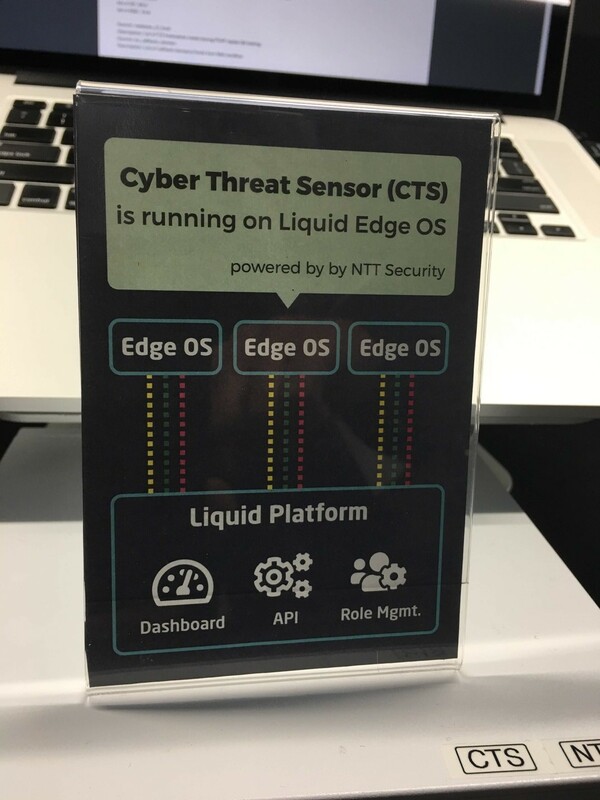 Cyber Threat Sensor (CTS) is a solution that is developed by NTT Security to implement security functions, such as threat detection, at customer edge. With NTT i3’s Liquid Platform and CLOUDWAN solutions, we can deliver security services in minutes instead of months. As soon as a customer has received a CTS/Liquid enabled box and powered it on, it automatically connects to our platform through a secure channel, and starts analyzing and detecting threats within customer’s premise. Alternatively, CTS can be installed in the cloud for the even faster deployment without the need to physically send and cable the box. 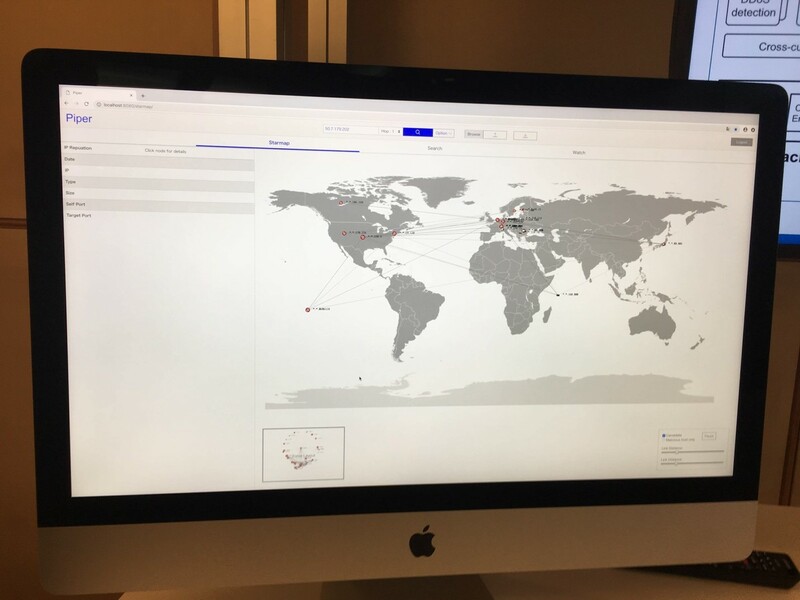 NTT Secure Platform Laboratories (SC Labs) presented the TLS Screen solution, which dynamically controls the connections and accesses the IoT devices in a massively scalable and responsive manner. 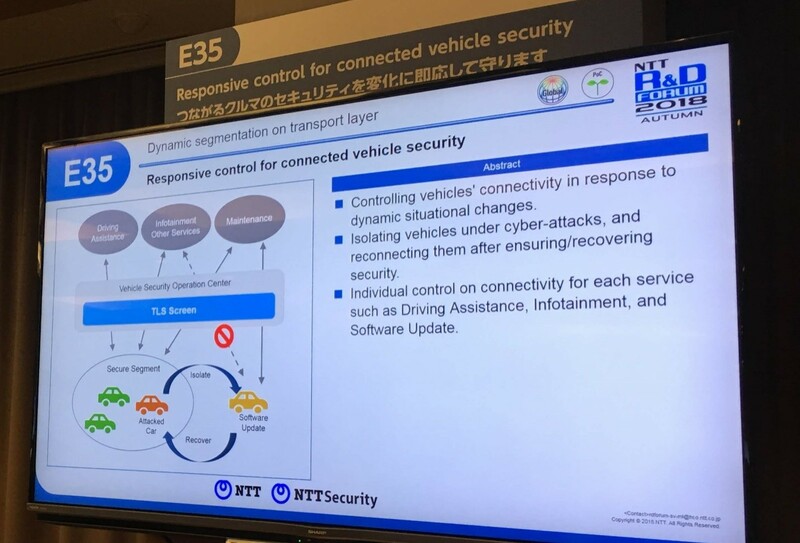 In this demo, TLS Screen was applied to control vehicles’ connectivity in response to dynamic situational changes, such as cybersecurity attacks. 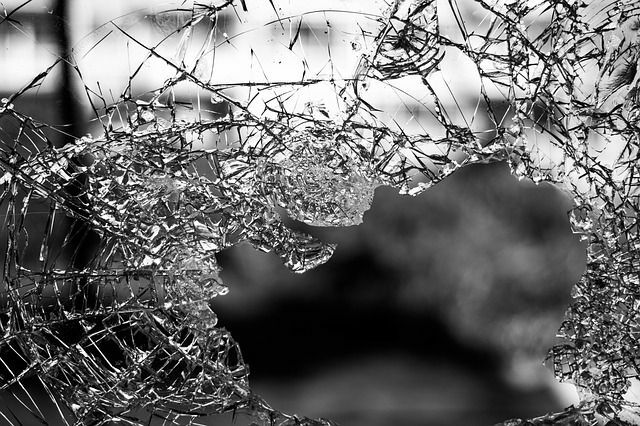 At such events, TLS Screen can isolate vehicles under attacks and reconnecting them to the network systems after the securely validated remediation all through a unified dashboard as a single pane of window. These technologies are just one part of our innovation efforts. Additionally, we are conducting research projects with NTT R&D on Operational Technology (OT) security, URL/domain inspection, malware analysis, and threat intelligence. 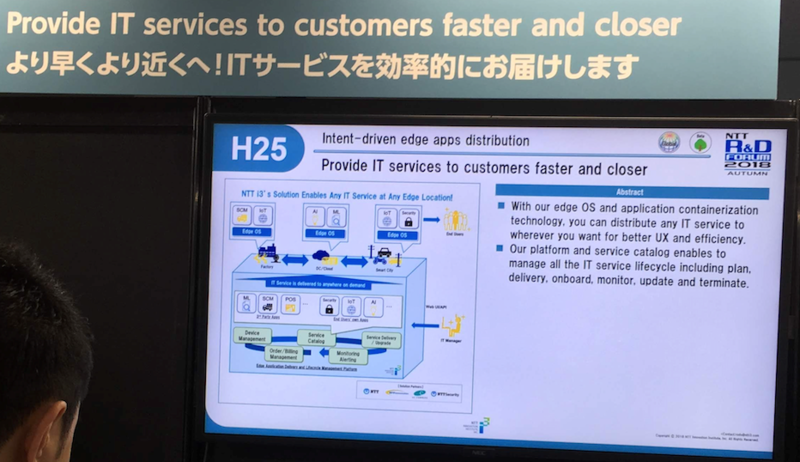 NTT Security continues to keep sharpening its edge through open innovation with NTT R&D, partners and customers. As I walked through the NTT R&D Forum booths, I found the aspect of “security” in many places. NTT is spending every effort to protect our customers and networks by continually going the extra mile – even into the deep sea and over the sky. A research project, for example, is employing AI to detect deficiencies with optical fibers in marine cables on the deep seabed while another project is looking at how to detect errors in electronic systems, which are caused by cosmic rays from the sun and the galaxies. The bottom line? NTT is here to protect you!